In today’s world, we’re constantly exposed to ideas about how we could do things better. And I think that’s a beautiful thing. But there are times when we allow all that information about doing things better stops us from doing anything—and that’s less beautiful. Because sometimes what you truly need is to put your head down and do something. You need to put something out there, whether it’s an email telling someone how you can help them, a blog post that you know will make a difference, or an Instagram post that will connect with your people. I should redesign this PDF before sending it to this potential client. I know it could be better. I should print out this blog post and read it before posting. I know it could be better. I should sit down and plan out Instagram content for the next month. I know I could be doing better. See, knowledge can be dangerous. Because not only do you know what you should do, you know what you could do. The tough thing to figure out, then, is what you can do. Because should and could don't always account for the other factors in our lives. Do you have the time or mental energy to redesign that PDF plus clean your house before visitors arrive for the weekend? Do you have the time or mental energy to proofread your blog post one more time before you pick up your kids or dog from daycare? Do you have the time or mental energy to plan out Instagram content for the next month while also fulfilling obligations to current clients? Sometimes the answer is yes—and if so, I say go for it. If you’re hit with a burst of insight and inspiration, and you find you have the time and energy and space, this may well be something you can do. But sometimes the answer is no—and that’s when we often get stuck. Instead of thinking, Well, I’ll just send do this anyway, and then make a plan for doing it differently later on, we stop. We get paralyzed. We do nothing. And doing nothing isn’t a great option. So I say let’s commit to doing what we can. Let’s do the best with what we have now, rather than letting all the shoulds and coulds hold us back (oh, how good they are at holding us back!). Do I want to make time and energy for that should or could? Who could help me get it done? When you take a few minutes to look carefully at nagging shoulds and coulds, you often find yourself more clearly understanding the things you can do—which feels like a pretty beautiful thing to me. 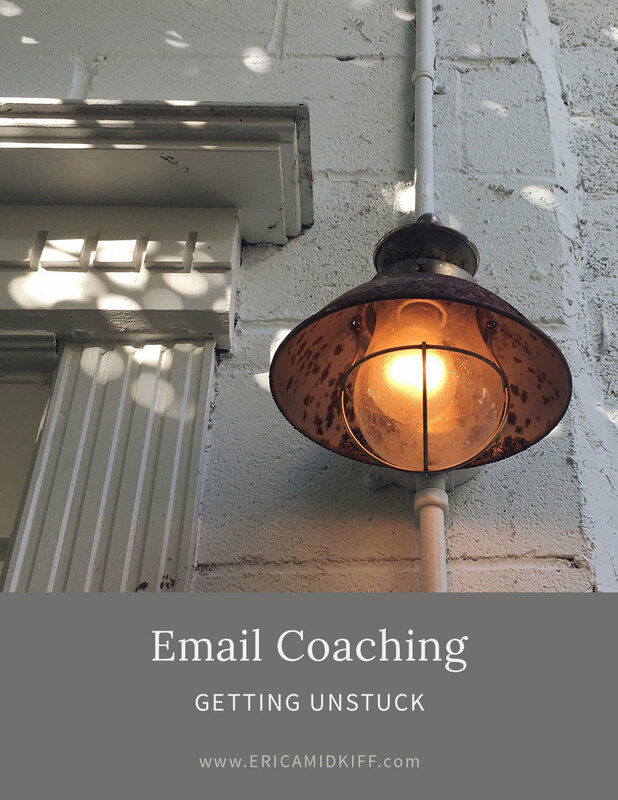 If you feel stuck in the should vs. can space, check out Email Coaching. It’s a direct line to me where you present what’s making you feel stuck and then sit back and wait for me to write back with ideas, advice, resources, options—whatever feels right for your situation. With a one-week turnaround time, it won’t hold you up from doing what you can—and might just help free you from a should or could or two. Ahhh, here we are. A brand-new year. Just the idea of it brings to mind the thrill of sliding into freshly washed sheets. But the truth is that those sheets, no matter how diligently you wipe your feet or shower before bed or avoid snacking in them (ahem), will get dirty again. And your year, no matter how well you plan and how excited you get about the fresh start, will eventually feel like the same-old. It’s inevitable. But the beauty of laundry is that (theoretically) you can get the feeling of fresh sheets any time you want. You have to do a bit of work, yes, but the possibility is there. And I believe the same is true for your year. By all rights, March 22 and June 3 and September 14 and November 19 are just as good as January 1. They hold all the same promise of possibility, of beginning anew, of making change. So how do you keep that new-year feeling going? Well, I don’t know. (If you do, can you tell me?) Because all logic aside, there is something that feels special about January 1. We can’t help it. But what I do know is that I want to keep the feeling going. I want the optimism, the clear-headedness, the excitement, the sense of possibility. I like that feeling. So I’m here to share a few things I’m doing this year to try to hold onto that feeling. Some I’ve done before and some are new to me, but all are helping me feel like I can keep coming back to that fresh-sheets, new-year feeling—because I’ll be constantly evaluating what works, what doesn’t, and where I’m heading, always knowing I can change directions any time I want (which seems to be at least part of the magic of a new year, no?). I’ve done Unravelling the Year Ahead (which Susannah generously gives away for free year after year) every time she’s offered it. When fall hits, as others are going crazy for school supplies, I start daydreaming about doing this work. It’s that good. In Unravelling, Susannah gently guides you to take a look at the year that’s passed and decide what you want more and less of in the year to come, making gentle commitments to yourself to forgive and take care of yourself as you go. Last year, she added the Find Your Word course (also generously free), and it’s the perfect complement to Unravelling the Year Ahead. I had already been thinking a little about a word for 2016, but after doing the work, I chose a word that totally surprised me—and also immediately felt right. Susannah does powerful work and I can’t recommend it enough! A couple of months ago, Alaya offered a free online workshop called Work // Life // Self: Balancing It All Without Burning Out. In the workshop, we chose one of five life areas to focus on and went deep into how we wanted to feel, what was working, what wasn’t, and changes we could make (whether that’s adding things or letting go, internally or externally). Over the winter break, I printed out five copies of those worksheets and went deep into each area of my life, working through all of those things and coming up with some pretty intense insights. If you haven’t been following Alaya, check her out—she’s a beautiful, grounding presence in my life and I always love hearing from her. I have been following Jess for years, and have so enjoyed watching her grow into the place she’s in now. She is open, honest, enthusiastic, and just a joy to listen to (on her podcast). I’ve attended two of her live Life with Intention free workshops, and taken copious notes—and now I plan to set aside some time, just as I did with Alaya’s work, and really set some intentions for myself. I’d love to take her course the next time it opens up—I love the way she thinks about achievements and the three levels of success! Jessica is a professional intuitive, and I love getting her weekly emails—she channels guidance specifically for us, and it’s spot on every time. She’s a beautiful presence in my life! On her blog, she has offered up a beautiful, affirming practice to use any time you want to (in her words) hit the reset button. I won’t give away Jessica’s approach, but definitey go check it out—especially the part about the coconut! I haven’t done this practice yet—I’m saving it for when I start to feel doubt or fear or stress creep in. I know it’ll be perfect at that time. Many of you already know how much I love Tara. She just speaks about business in a way that makes sense to me, all while feeling approachable and relatable. A while ago, she started talking about the idea of a Chief Initiative, and while I struggled with it at first, I’ve finally figured it out and boy is it powerful. The basic idea is that you only pick one big project or goal or intention (I know everyone uses different language here) to focus on for the next six to twelve months, and then you map out smaller projects / goals / intentions to support that one big thing. This is where the insights I’ve gained in the above work becomes real—where I make some commitments and start working toward them! You can read a little more about it here and here (I went a bit more in-depth in a free workshop she offered). 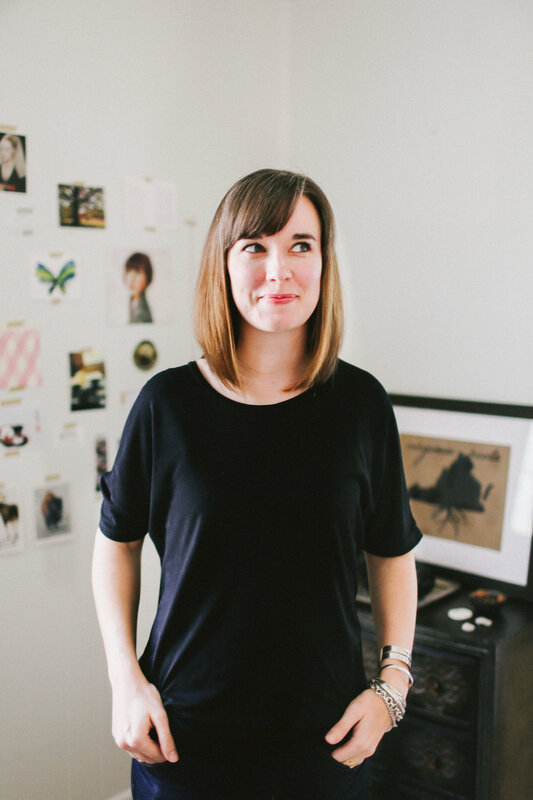 I can’t recommend Tara and all that she does (check out her CreativeLive classes, too) enough! I’ve been doing regular check-ins for a while—each Friday, I do a weekly review where I tidy up from the week and plan out the next week, and do some small admin things that help keep me feeling sane. But this year, I want to get more intentional about reviewing the big picture regularly. It’s way too easy to get caught up in the day-to-day and think, Oh, I’ll do that later—but I do best when I revisit the deep work I’ve done and see how things are shaping up. It definitely helps me keep fear and stress and overcommitment and comparison at bay! I hope this list sparks some ideas for you—even if you don’t do any of the things I mentioned, I’m hoping you’ll feel encouraged to find your own ways to keep that new-year feeling going all year round! Your ideas and dreams are totally worth it. If you’d like to share, I would love to hear what you have planned for this year!